Applying for the card is easy. Starting November 2, Uber will give users the option to get the card right in its app, and will populate all of the information they have on file for their customers into the application. Folks also can apply for the card online. After a few minutes, an applicant can get a verdict on their creditworthiness and then… Presto! 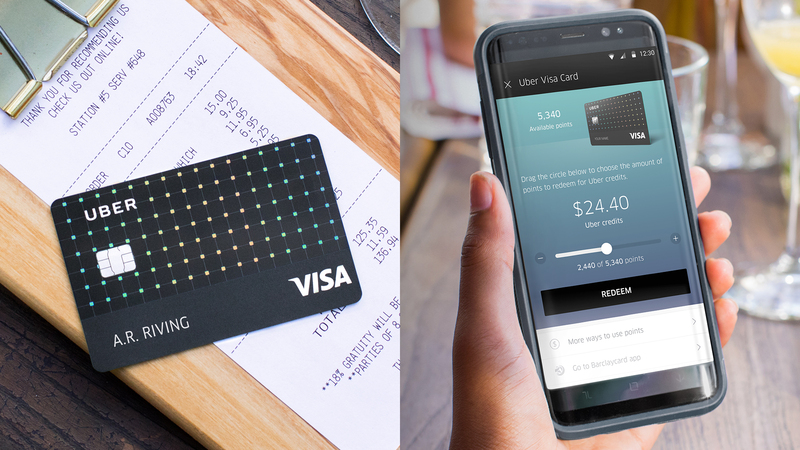 The card is automatically available for use for Uber rides and UberEats purchases and a physical card will show up in the mail within a week or so. The no-fee card offers a bonus of $100 after spending $500 on purchases within the first 90 days, and has other perks, like 4 percent back on restaurants, take-out and bar purchases; 3 percent back on airfare, hotels and Airbnb or other short-stay rentals; 2 percent back on online purchases; and 1 percent back on everything else. 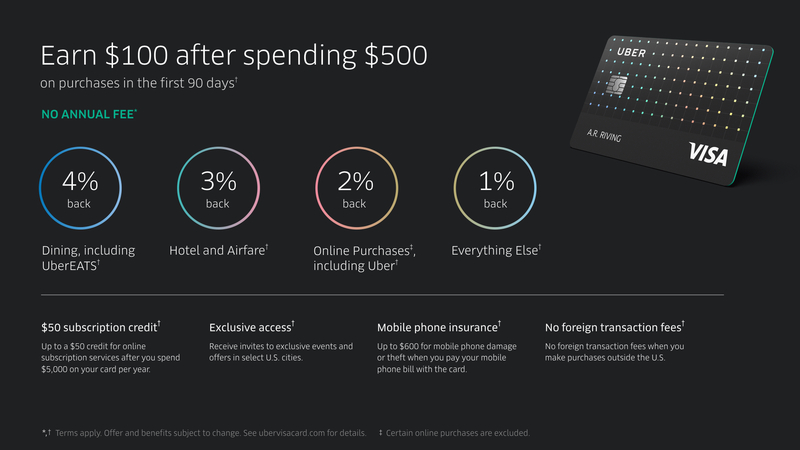 The new card also gives users a $50 credit for online subscriptions (after spending $5,000 on the card per-year), phone insurance of up to $600 if someone uses the card to pay their monthly phone bill; and exclusive invites to events for card members. To unpack that a bit, in exchange for fronting the cash and getting information about the $5,000+ worth of stuff you’ve bought, Uber will hook you up with $50. And the company’s card will also insure your phone once it has information on your carrier and what you’re spending money on through that carrier. That’s an almost Amazonian level of information Uber could get about its customers. But, David Richter told me the company would not be selling to third parties any of the data it collects. Folks can also track and redeem points for Uber credits, cash back and gift cards. The app’s integration within Uber looks beautiful, and it’s a clever way to capture all that valuable data… If you’ve already given up on the notion that data is any way private or not a commodity, then the card is probably not a bad bet… the perks seem good. For a comparison of how the perks stack up, here’s a list of NerdWallet’s top rewards credit cards. It’s just… Uber has had issues with privacy in the past, and that might be something that should give consumers pause. For one, Uber built out a God-mode to let employees check the comings and goings of users with little to no restrictions or transparency. The company also built a feature that tracked user locations once they’d left a vehicle. The card will come with annual percentage rates of 15.99 percent, 21.74 percent and 24.74 percent based on an applicant’s credit worthiness… and there’s no upper limit on credit lines, according to a Barclays spokeswoman. This push into payments comes as the battle for customized shopping experiences for consumers heats up. Amazon already has so much data about what its customers are doing that it can offer a compelling argument to be the main (potentially only) retail outlet for a consumer. Where Amazon runs into limitations is in the physical world with actual restaurants and other grocery stores. With its new credit card, Uber could make a compelling proposition for companies that want to find a way to offset the Amazonian monolith. By getting all that payment information, Uber can begin pairing with merchants to offer customized offerings, paid off with an Uber card. Also worth mentioning is that this push into credit is the opposite path that Uber’s big emerging markets rivals have taken with their own payment features. Southeast Asian ride-hailing platform Grab bought Kudo earlier this year as a way to get its customers access to basic digital financial services, and Ola built out a standalone app for the same reason. It’s a different path, but same goal to be more relevant and “top of mind” for users. In the U.S. this gambit is a new front in the war for customer loyalty and dollars. Your move, big e-commerce giants.